Do you struggle with meal planning? Maybe you make it work for a week and then the meal plan falls apart. Maybe you don’t have the time to make the meals you planned or you forget ingredients on your weekly shopping. Or, possibly you just don’t feel like eating the meals you planned that week. Whatever your struggle, there are simple hacks for getting dinner on the table every night effortlessly and making meal plans work for your family. Keep it Simple – When you are planning your menu, use simple recipes that you’ve made before. Most families cook the same 15-20 meals and rotate them. A meal plan is just writing down those meals and picking up all the ingredients in one shopping trip. If you are just starting to meal plan, write down seven meals you already cook for your family. That is your first meal plan! It’s as simple as that. Consider Your Schedule – When your making your weekly meal plan, consider your schedule and make it work around your commitments. There may be some nights there is no way you can babysit a meal on the stove for 30 minutes and need to rely on a slow cooker meal or freezer meal. That’s okay. A slow cooker meal you start in the morning takes as much time to serve as it does to sit in the drive-thru lane at a fast food restaurant. Your waistline and wallet will thank you for cooking at home more. Prep, Prep, Prep – Our lives are busy and the more prepared you are, the easier it will be to throw your meals together each night. For example, I chop all my onions in the mixer and freeze them in 1/2 cup portions, so they are always ready for a recipe. There’s way less tears when I chop onions in bulk too! I also pre-cook beef and chicken in bulk and freeze. When I need to add a cooked meat to a meal, it’s already prepared and saves me time. 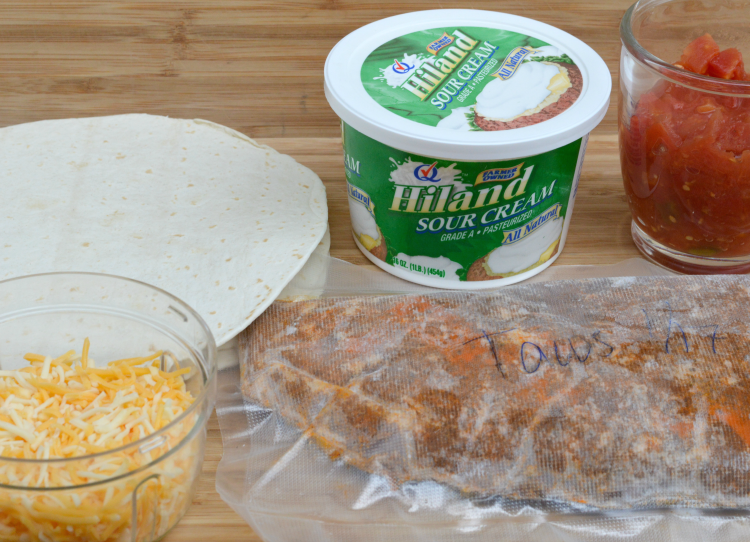 Freezer Meals – Freezer meals have been a lifesaver for me on busy nights. Basically, you cook double or triple of a recipe and freeze the extras. We have shared many freezer friendly recipes on this website. One item I always have in my freezer is pre-cooked taco meat in 1 lb portions (pictured below in freezer sealed bag). On busy nights, I can simply re-heat the meat in the microwave for a few minutes. Then, I just fill tortilla shells with taco meat and top with Hiland Dairy cheddar cheese and sour cream, diced tomatoes and olives. Viola! Dinner is served in less than 5 minutes. That’s why is so important to also keep a well-stocked fridge & pantry, so you can throw together meals like that in no-time. Keep a well-stocked pantry & fridge – You need to ensure you have a full fridge of essentials, like Hiland Dairy cheese, cottage cheese and milk, bread, meat, condiments and your family favorites. I’ve found that even if my meal plan falls apart, I can throw together something quick & healthy, like grilled cheese sandwiches or pasta & sauce with cheese by having those items always in my pantry or fridge. Freeze a few essentials – Have you ever made mashed potatoes and looked in the fridge and realized the kids drank every last drop of milk? And, all you need is one little cup to complete your potatoes! Solution: Freeze Hiland Dairy milk in heavy duty freezer bags in 1 cup portions so you always have some on hand. To defrost, simply run under cool water for a few minutes. This is also a great hack if there’s just a little bit of milk left and you need to use it all up. You can also freeze shredded cheese, butter and select fruits and vegetables. A well stocked freezer will keep you from making those in-between trips to the grocery store that add up fast. Plan Leftover Nights – Unless you are feeding a large crowd, it’s likely that you have leftovers from the meals you cook. Every 3-4 days schedule a leftover night to clean out the fridge and give the cook a night off. Get the Family Involved – Let your spouse and kids help create the meal plan. I let my kids pick one meal of their choice every week. This is a great way to get assistance with the meal planning and also give picky eaters a voice. Create a Master Meal Plan & Shopping List – Most families eat the same meals over and over, so consider creating a master menu plan. Jayme shared a master menu plan with printables a few weeks ago. 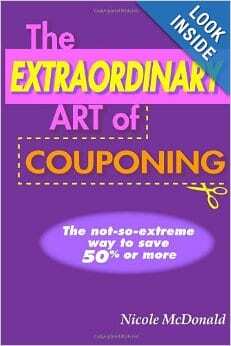 You can view my shopping list I use that is designed specifically for couponers. Recycle past meal plans – I often see those pretty dry erase boards used for meal planning, but I recommend you also keep hard copies. I’ve included a free printable weekly menu plan that you can print and save. 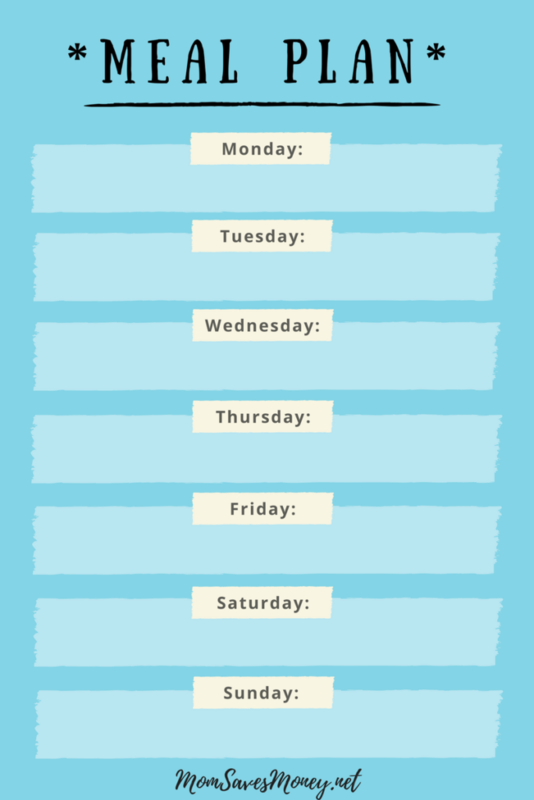 Once you fill out 4-6 weeks of meals, you can simply reuse past weekly meal plans. This helps put menu planning on ‘auto-pilot’. Simply file these completed printable weekly meal plans in a 3-ring binder or folder for easy access. Don’t forget to include where you found the recipe when you create your meal plans. 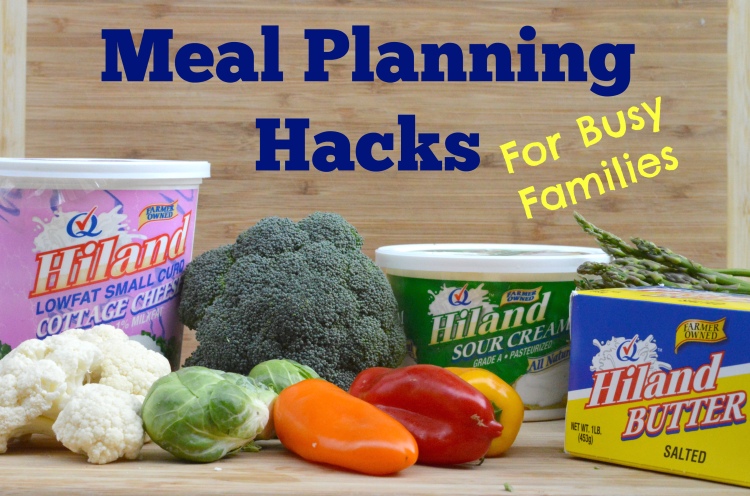 For more great tips on meal planning, join Hiland Dairy’s free meal planning enewsletter. They will share freezer meals, 20 minute or less meals & budget-friendly recipes! Plus, you get money saving coupons delivered right to your inbox. What are your tips for following your weekly meal plan? What struggles do you have with meal planning? I don’t know why is so dificultades for me to write de meal plan. I hope and I need to start. Thank you for your tips. I have been using the mealboard app for meal planning and it is fantastic. It’s $3.99, so didn’t break the bank. You can input all your recipes, schedule them on a calendar in the app, then send the meal plan and a shopping list to yourself via email! Highly recommended if you are using momsavesmoney’s excellent meal planning and saving system!